Jifflenow is a corporate meeting management and sales advancement solution for B2B companies designed to help them maximize business opportunities and drive more sales by helping users schedule, track, and analyze B2B meetings with prospects, clients, and partners within a secure cloud environment. It functions closely with the users’ existing CRM systems, helping them schedule meetings, bring everyone to the same page, reduce no-shows, and turn every event into a success story. With Jifflenow, scheduling and managing meetings and interactions at events are easier and more streamlined. All data gathered during meetings are stored, centralized, and analyzed to help users discover more business opportunities and find doors and paths that lead to more sales and business growth. Jifflenow helps you create and discover more opportunities each and every single time you meet with a client, business partner, or a prospect at events, conferences, offsite and more. 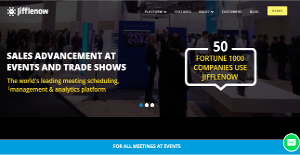 Whether you are in the boardroom discussing your business or at a booth in a trade show, Jifflenow provides you with a solution to snag more clients, convert leads, and advance your sales dramatically. The software makes meeting customers at events easy, quick, and painless. Jifflenow makes scheduling with emails and Excel sheets a thing of the past. You can create and monitor your calendar and all your schedules in the cloud, track your meetings and deliver notifications to your mobile apps. And when you need to schedule a quick meeting with high ranking executives and VIPs, Jifflenow helps you find them and book rooms with ease and speed. Jifflenow increases confirmed meetings by 40% while drastically reducing scheduling efforts down to 85%. Mobile apps on both Android and iOS systems helps yous schedule and track meetings even when you are on the go. Integration with Salesforce simplifies the way you schedule meetings with your Salesforce contacts. Data flow is seamless, enabling you to build meeting reports and create event dashboards within Jifflenow or on Salesforce.com. You can also share details of your deals with internal attendees effortlessly and check the impact of events on your sales pipeline. What Problems Will Jifflenow Solve? Companies that come to B2B events, trade shows and industry conferences often find it difficult to manage high meeting volumes at events. These sales meetings at events help them steer their customers and prospects along their sales pipeline, boosting their sales. They also have struggles calculating the ROI of the event and are unable to point out the impact of attending events to the sales pipeline of the company. Jifflenow streamlines the meeting management process and showcases ROI for the events, with a platform that tracks all in-person engagements. It also generates custom-reports for all interactions. There are trendy and widely used solutions in each software group. But are they essentially the best fit for your enterprise’s special wants? A popular software application may have thousands of customers, but does it offer what you require? For this reason, do not blindly spend on popular systems. Read at least a few Jifflenow reviews and mull over the aspects that you want in the software such as the price, main tools, available integrations etc. Then, shortlist a few systems that fit your wants. Check out the free trials of these products, read online opinions, get clarifications from the maker, and do your investigation systematically. This profound research is sure to help you choose the best software solution for your firm’s special needs. How Much Does Jifflenow Cost? Contact Jifflenow for enterprise pricing information and other product details. You can also submit a request for a demo to see if the software is a perfect fit for your business. We realize that when you make a decision to buy Collaboration Software it’s important not only to see how experts evaluate it in their reviews, but also to find out if the real people and companies that buy it are actually satisfied with the product. That’s why we’ve created our behavior-based Customer Satisfaction Algorithm™ that gathers customer reviews, comments and Jifflenow reviews across a wide range of social media sites. The data is then presented in an easy to digest form showing how many people had positive and negative experience with Jifflenow. With that information at hand you should be equipped to make an informed buying decision that you won’t regret. What are Jifflenow pricing details? What integrations are available for Jifflenow?